Here is the grand prize winner from 2015 as an example of what we are looking for. 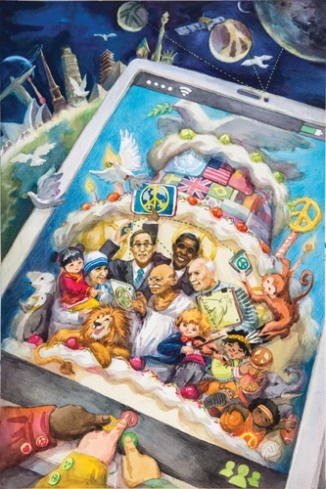 ﻿﻿﻿﻿﻿﻿The Grafton Lions Club is once again sponsoring the annual Peace Poster Contest which is a project of Lions Clubs International. This years theme is “A Celebration Of Peace”. • Contest is open to students who will be 11, 12 or 13 years of age on November 15. • Artwork must be no smaller than 13 inches by 20 inches (33 centimeters by 50 centimeters) and no larger than 20 inches by 24 inches (50 centimeters by 60 centimeters). Do not mat or frame artwork. • Only one entry per student, and each entry must be the work of only one student. • All artwork must be the student’s original creation. Duplications are not accepted. • All media are accepted. Note: Chalk, charcoal and pastel entries should be sealed with a fixative spray to prevent smearing. Do not laminate entries. • Three-dimensional entries will not be accepted. Nothing may be glued, stapled or attached to the artwork in any way. • The use of lettering or numbering on the front of the poster, in any language, is not allowed. All artist signatures or initials should be written on the back of the poster. • Artwork should be done on a flexible material, so it can be rolled for shipping in a mailing tube. Do not fold poster. All Entries Need To Be Turned In At The Main Office Of Your School, or mailed to Frank Sutton, 28 Hawthorne St. North Grafton, MA. 01536 by November 14th. There is a $50 cash prize for the first place winner, and a $25 cash prize for 2 runner ups. There are other prizes as you move up in the contest and if you are the international winner you will be invited to attend a special ceremony at the United Nations with your parents.